I've been having fun playing with shapes and structure in apparel lately. Typically, I'm used to defining "structure" as fitted. Boxy loose clothing were not good. But now, I've embraced baggy sweaters, not only for their comfort, but because of how effortlessly good they look with straight-cut bottoms. I'm also really loving how throwing a sweater over a knee-length skirt naturally makes it more casual and wearable for any day. Being in casual office environments where employees tended to wear flip flops in the summer, I always felt overdressed in pencil skirts. I'm glad that my work skirts don't have to collect dust anymore. I've also found that I prefer structured bags. Unlike unstructured ones, structured bags still look good when they're empty. And especially with a bag that has more than 4 corners, the shape stands out a lot more. Against a minimalist outfit, why go for a pop of colour when you can go for a pop of shape? 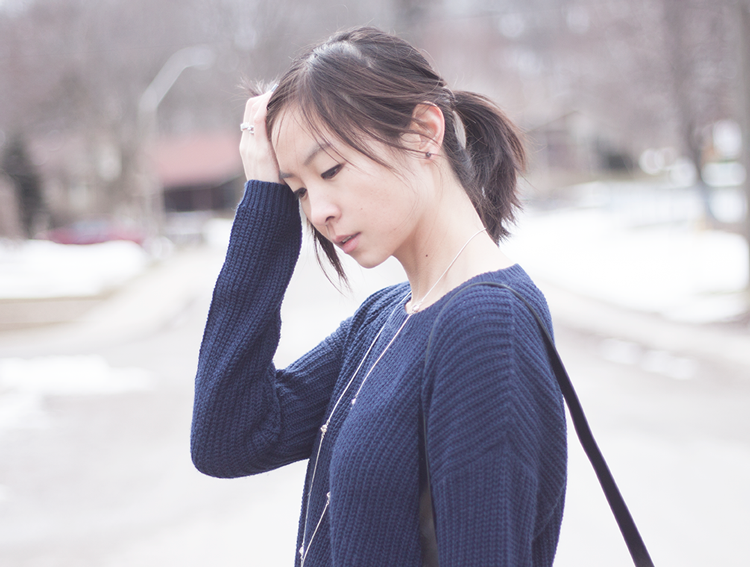 Really loving loose clothing as well - it really looks great on you, especially the oversized sweater! Adorable! And the contrast with the structured bag is very chic! I have never thought about adding a "pop" of shape. That's brilliant! I love the minimal look! And great bag! You look amazing. I always thing your hair looks so great. I have been loving structured bags lately too. Love this navy, black and white minimalist look. The structured bag really does pop! Beautifully put Sabrina. I also love wearing something loose over a pencil skirt, the combo is relaxed but not sloppy . I also agree about the structure bag, and think that adding an Intersting shape is an underutilized style tool. You are looking gorgeous, by the way. Chunky, oversized sweaters are the best, Sabrina; they give everything you pair them with a lived-in cozy feel...and some days, that's just what you want for work, too!! 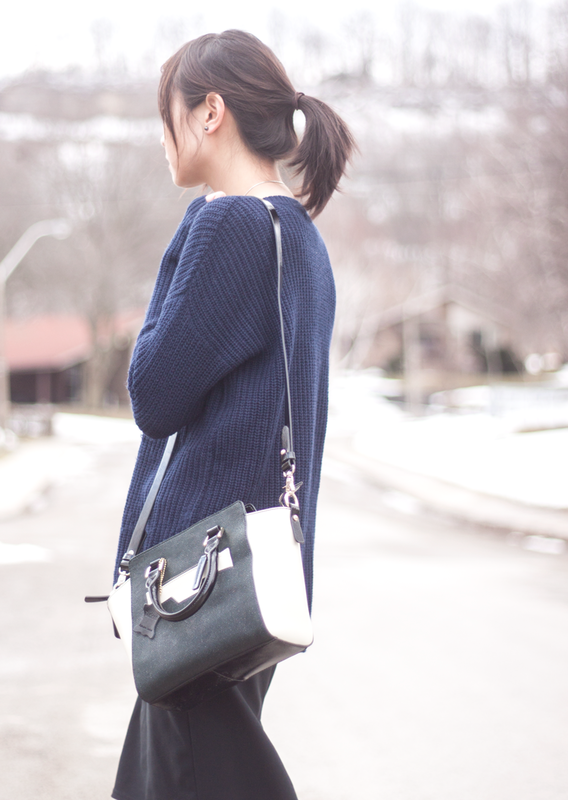 Like you said, the way you've paired your navy sweater with a pencil skirt and this structured bag makes sure you still look office-appropriate!! 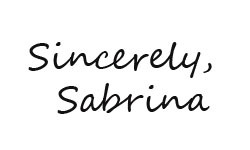 Hi Sabrina, thanks for visiting my blog and commenting :) I love your outfit, it looks so comfy and stylish. I love the ankle boots too, I don't think we have long for boots so I want to get the most wear out of mine for as long as I can. Although the winter here in Toronto was cold and snowy I busted out my stockings, skirts and boots the whole season lol! Simple and elegant look is always great idea. In most of occasions I feel more dress up then others, but most important is to stay true to your personality. You look so beautiful! Amazing outfit! i love me a perfectly oversized sweater. cute little bag! I like the sweater, it's a great way to make the black mini more relaxed. Lovely outfit altogether! I love this baggy/loose sweater worn with midi lenght pencil skirts or minis..I also loved these kind of looks one of the most on runways,totally wearable on street too :) You look great in this simple and chic outfit. Sabrina you look splendid, very chic! Very nice! Love the shoes! Fantastic look! So urban-chic and effortless! What a great comfy look! Love that sweater! You seriously have the best bags ahahah i love this one as well!! I really love this outfit - you look so trendy and classy. The shape of this outfit is fantastic; I love the over sized sweater with the fitted skirt. This is just my style! I have been sporting that look all last season. Its so comfy. You look great and polished.